Byron passed away in an ambulance outside his house. He was recovering from a big operation which he had recently had due to a life threatening condition. He was 77 years of age. Byron was born in Llanelly in 1935 and at the age of 12 years old he came to Hereford to attend the Hereford Cathedral School. He excelled at all sports but particularly rugby, cricket and boxing with rugby being his passion. He was a member of the HCS Colts X1 for cricket and rugby in 1950, the HCS Boxing Team in 1951, the Old Deanery Senior XV for rugby in 1951, HCS 2nd XI for cricket in 1951, Deanery XV for rugby in 1952 and HCS 2nd XI for cricket in 1952 and HCS 1st XV for rugby in 1952! After HCS Byron went to a school in Swansea where he captained the Carmarthen Youth Rugby Team. At 18 he was conscripted for National Service and became known as “Taff”. He worked for the Service Intelligence Bureau in Berkeley Square, London, spending his time in civvies listening in to conversations. However, he argued with his sergeant and was promptly transferred to the Military Police based in Shrewsbury. It was whilst he was in the Military Police that Byron met his wife Barbara. He also continued with his other great love, rugby, playing for the Western Command. After National Service Byron enrolled to train as a teacher at Carleon. His name is engraved on a plaque as the only person that year to graduate with a distinction. In August 1958 he married Barbara. His teaching career started in Shifnal Secondary Modern, Shropshire, where his daughter Linda was born in September 1959. From Shifnal the family moved to Builth Wells where Byron taught physical education for 6 years. A colleague described him as “inspirational”. His second daughter Julia was born here in May 1963. Byron returned to Hereford in 1966 to teach physical education at Whitecross Boys School. 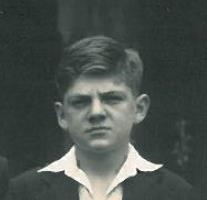 He is remembered by an ex-pupil as someone who would never ask the boys to do what he himself was not prepared to do. In 1967 Byron changed course and went to teach at Holmer Primary School where a year later he became the Deputy Head Teacher. After Byron retired an ex-pupil wrote to him. He explained that one of the happiest days of his life was when he made him Sportsman of the year. Indeed he honoured him by naming his child after him. From Holmer Byron became Deputy Head Teacher at Broadlands Primary School in January 1971. Between 1977 and 1979 he was made Acting Head Teacher at 4 different country schools. He then returned to Broadlands as Head Teacher. He opened Hereford’s first pre-school nursery feeding directly into a primary school and in this respect was pioneering. Byron dedicated himself to the school and was fully supported by the parents and staff. By the time he retired from Broadlands he had retrieved the school from one class per year to two classes. Byron gave every child the chance to shine. A parent once related his confidence that his child would have the same opportunities as any child under his leadership. On his retirement he left two cups: The Mages Cup for the best improved girl and The Mages Cup for the best improved boy, whether awarded for behaviour or academic improvements. He retired in 1995 and received many letters of thanks and gifts of appreciation from former pupils, parents and staff. During Byron’s retirement years he and his wife became global travellers exploring Thailand, China, Australia, New Zealand, the USA, Sri Lanka, Malaysia, Singapore, Vietnam, The Cook Islands, Mauritius and more. He loved the adventures travel brought - he rode an ostrich, survived tuk tuk rides, climbed the Great Wall of China, saw the Terracotta Army, went paragliding, took a helicopter over the Rockies and hired a motorbike to explore the Cook Island with Barbara riding pillion. Without doubt Byron’s grandchildren Becky Barbara Mages-Pigott and Adam Byron Mages-Pigott brought him the most amount of pleasure and happiness. They were his joy. He is very sadly missed by us all.